John tries out amateur radio equipment. SERIAN: Youths have been asked to pick up amateur radio not just as a hobby but a skill to ultimately lend a helping hand to the authorities in times of emergencies. 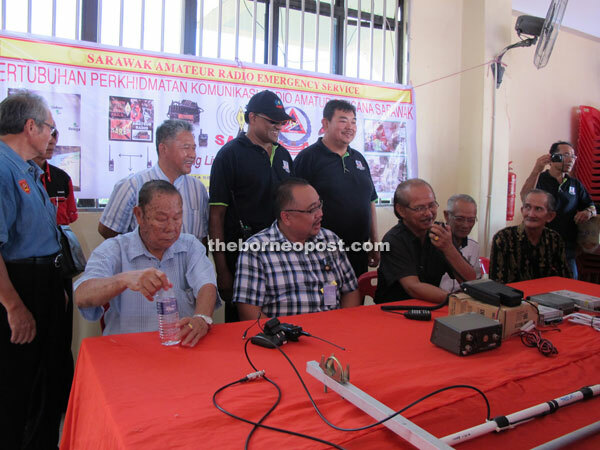 John David Nyaoh, a political secretary to the Chief Minister, said this when opening a workshop by the Sarawak Amateur Radio Emergency Services (Sares) yesterday. “I urge young people to be involved in amateur radio, make it a hobby so that eventually you are able to assist your countrymen and villagers during emergencies. “By so doing, you will help save lives and properties,” he said when representing Minister of Infrastructure Development and Communication Dato Sri Michael Manyin Jawong at the workshop attended by 150 individuals. John recalled a time when the only means of communication was radio particularly in rural areas. “There was no other form of communication, no TV and not even newspapers. The information we got was very little and we had no news about what was happening on the other side of the world. He pointed out that without an effective means of communication, lives were lost when natural disasters like floods and landslides happened. Amateur radio, also known as ham radio, he said, could operate on its own without the need for power supply. He announced on behalf of Manyin a government grant of RM5,000 for Sares, a non-governmental and non-profit organisation formed in October last year. Meanwhile, Sares vice-president Joseph Siong said a couple of helicopter tragedies in remote areas and boats sinking in Belaga and Kapit prompted a team comprising various professionals to set up the emergency radio unit to provide first responders with communication support. “We are volunteers, and we have limited manpower. We intend to recruit more people, especially young ones, to join us in order to assist the Civil Defence Department (JPAM) during emergencies. “We are now a partner of JPAM, assisting them in their communication and technical matters. JPAM has requested us to install the communication equipment for them, which currently covers areas such as Lundu, Bau and Serian,” he said.